Anderson Family Dentistry is a single doctor practice with a small town family feel. Our goal is to provide patients with a positive dental experience and assist them in achieving optimal oral health. 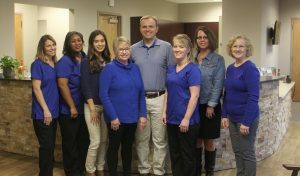 Dr. Anderson and his staff customize each patient’s dental experience to meet his or her individual needs. We recently relocated to the Waterford Shopping Center in Midlothian. Anderson Family Dentistry offers a wide variety of services, including crowns, bridges, implant restorations, cosmetic and pediatric dentistry, as well as Invisalign. Anderson Family Dentistry takes pride in serving Chesterfield County and its surrounding communities. You can count on our friendly, knowledgeable, and compassionate team to deliver high-quality, gentle dental care in a relaxed, welcoming atmosphere. We strive to educate and encourage each patient, which allows us to build lasting relationships.